Running for 10 weeks our masked hero will conduct a daring experiment to find out the most popular book in his collection. Each week our Lone Ranger will leave a book in the same secret location in a public area. To time how long it is before someone starts to read it or ... gasp ... takes the book Away! He will then report back to us at The View and we will place the book in our table with the quickest times at the top of the chart. So which book will top our chart after 10 weeks? How many will the Lone Ranger loose? Will he just get really bored? "I'm up for this challenge," said the Lone Ranger to the magazine, "It will take all my covert skills to stay under cover, but I will be brave and deliver each week." When asked how he would pass the time, our Lone Ranger said he would probably place the book near a cake shop and eat donuts as he waited. Gosh! 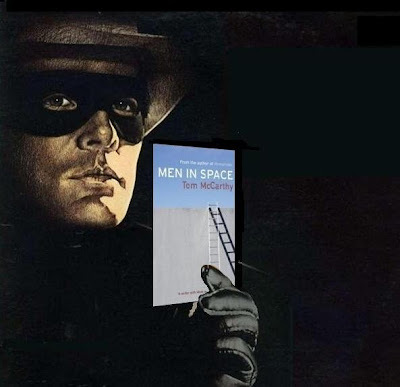 - Look in next week to see how Tom McCarthy's book Men in Space gets on. Just a suggestion, but the LR might want to skulk around subways, airports, libraries, and maybe even public parks on a nice day. He's already ridden off Kathleen - he doesn't hang about! What am I an indian?! Bookcrossing is cool - although I've never tried it - I thought about putting a Book Crossing ID in the books, but I don't want anything in the book that might effect if it gets taken away or not. I mean this is a serious scientific study!